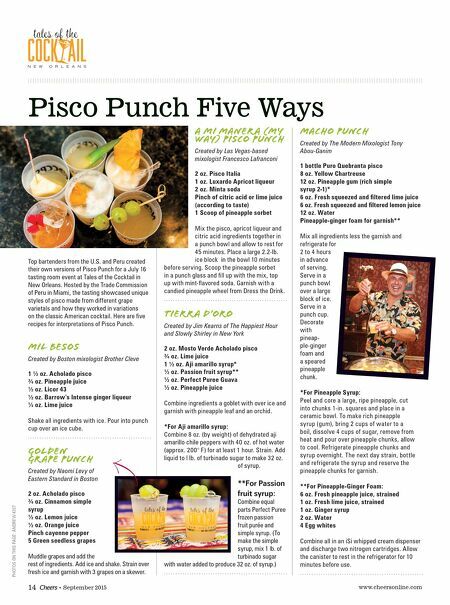 www.cheersonline.com 15 September 2015 • When it comes to tending bar, human interaction skills are as important as mixology prowess, according to Dushan Zaric of spirits company The 86 Co. and New York bar Employees Only. So you have to build a solid team that gets along with each other and performs well under pressure, he said during a session at Tales of the Cocktail on July 15 in New Orleans. How? Remember that trust + talent + positive attitude = successful businesses and happy employees. The seminar, moderated by Zaric and The Cocktail Guru Jonathan Pogash, included panelists Pamela Wiznitzer (of the USBG New York, The Dead Rabbit and Seamstress, New York), Bobby Heugel (owner at Anvil in Houston) and Zdenek Kastanek (mixologist/educator from Singapore). 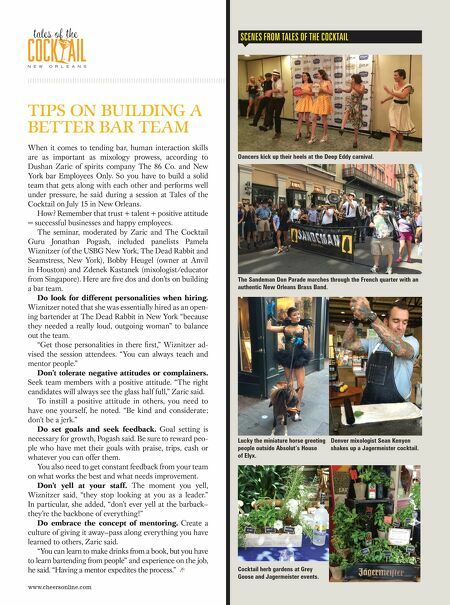 Here are fi ve dos and don'ts on building a bar team. Do look for different personalities when hiring. Wiznitzer noted that she was essentially hired as an open- ing bartender at The Dead Rabbit in New York "because they needed a really loud, outgoing woman" to balance out the team. "Get those personalities in there fi rst," Wiznitzer ad- vised the session attendees. "You can always teach and mentor people." Don't tolerate negative attitudes or complainers. Seek team members with a positive attitude. "The right candidates will always see the glass half full," Zaric said. To instill a positive attitude in others, you need to have one yourself, he noted. "Be kind and considerate; don't be a jerk." Do set goals and seek feedback. Goal setting is necessary for growth, Pogash said. Be sure to reward peo- ple who have met their goals with praise, trips, cash or whatever you can offer them. You also need to get constant feedback from your team on what works the best and what needs improvement. Don't yell at your staff. The moment you yell, Wiznitzer said, "they stop looking at you as a leader." In particular, she added, "don't ever yell at the barback— they're the backbone of everything!" Do embrace the concept of mentoring. Create a culture of giving it away—pass along everything you have learned to others, Zaric said. "You can learn to make drinks from a book, but you have to learn bartending from people" and experience on the job, he said. "Having a mentor expedites the process." TIPS ON BUILDING A BETTER BAR TEAM SCENES FROM TALES OF THE COCKTAIL Dancers kick up their heels at the Deep Eddy carnival. The Sandeman Don Parade marches through the French quarter with an authentic New Orleans Brass Band. Lucky the miniature horse greeting people outside Absolut's House of Elyx. Denver mixologist Sean Kenyon shakes up a Jagermeister cocktail. Cocktail herb gardens at Grey Goose and Jagermeister events.